Hamburg has a long history of Cruises and ferries operating from the city port. ParkVia offers Hamburg port parking options when you are starting your cruise from here or if you are taking a ferry for a period of time. We aim to show car park options which are the best priced and most secure locations around the port. To get an idea of prices for your long stay Hamburg port parking, enter the dates you wish to park there and see what is available. Prices may vary throughout the season, as at peak times it gets quite busy. Pre-booking is also advisable for the same reason. The car parks can get full quickly during cruise season. 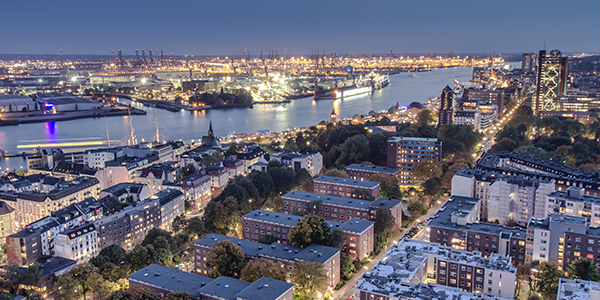 Even though it is about 70 miles (110 km) from the coast on the river Elbe, the Port of Hamburg is considered a sea port since it is able to handle large ocean-going ships. It is the largest port in Germany, the third-largest in Europe (after the Port of Antwerp and Rotterdam), and the eighth largest in the world.